If there's anything one can depend on in this changing world, it's physical units. The kilogram, meter, and second have stood me in good stead since elementary school. But according to an NPR report on the radio this morning, the tried-and-true kilogram may be changing. That's because it's defined as the mass of an actual lump of metal, guarded by the high priests of the Bureau International des Poids et Mesures. Before continuing, I recommend you listen to the report (it runs about five minutes. You can also read the written story at NPR. As it stands, the entire world's system of measurement hinges on the cylinder. If it is dropped, scratched or otherwise defaced, it would cause a global problem. "If somebody sneezed on that kilogram standard, all the weights in the world would be instantly wrong," says Richard Steiner, a physicist at the National Institute of Standards and Technology (NIST) in Gaithersburg, Md. So the fate of all we hold dear depends on a few atoms crusting off a century-old platinum-iridium alloy salt shaker in a bell jar outside of Paris? How did we get ourselves into this mess? To be fair to SI, the kilogram seems to be the only weak link in the seven fundamental units of the metric system. The rest--metre (length), second (time), ampere (current), kelvin (temperature), mole (amount), and candela (luminous intensity)--can all be derived from lab measurements of physical phenomena or substances. A mole is the number of atoms in 0.012 kilogram of carbon 12; the kelvin is 1/273.16 of the thermodynamic temperature of the triple point of water. I'll focus now on the meter and the second, being a little closer to home than the candela or ampere. Upon examination, it's not so suprising that the kilogram is changing; really, it's just catching up with the meter and the second, which have steadily evolved over the last hundred-plus years. The meter was originally defined as one ten-millionth of a quadrant, the distance between the Equator and the North Pole, based on a measurement taken in the 1790s (it's off by .02 percent). When the kilogram was forged in 1889, a platinum-iridium meter was made as well. The first Conférence Générale des Poids et Mesures announced, "This prototype, at the temperature of melting ice, shall henceforth represent the metric unit of length." The meter still sits somewhere deep in the bowels of the BIPM, perhaps somewhere in the region of the goblin carts and fire-breathing dragons. Similarly, the second has undergone a few changes over the years as well, and it's still evolving. Originally it was determined as a tiny fraction of a solar day, until astronomers realized the length of a day wasn't constant. So they hit on defining the solar day as January 1, 1900. While this is sort of cute, there are some inherent problems. As Russ Rowlett puts it in his online Dictionary of Units of Measurement, "Since we can't go back and measure that day any more, this wasn't a real solution to the problem." The fountain, in this case, consists of six infrared laser beams and a cloud of cesium atoms in the clock's vacuum-chamber gut. The laser beams clump the cesium into a ball that's nearly at 0 kelvin. This ball then rides upward on the "fountain" of two vertical lasers into a microwave cavity. As they rise and fall, some of the cesium atoms fluoresce; the clock keepers tune the microwave radiation until it maximizes the fluorescence. And this magic frequency is 9,192,631,770 Hz, the resonance frequency of cesium. But that's not likely to be the end of the story of how we measure time. 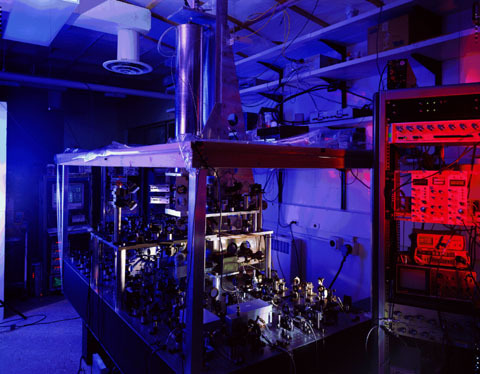 In the last ten years, NIST has been playing with a new kind of clock, based not on cesium but on ytterbium, cooled by lasers into pancake-shaped nano-wells. It seems not much has changed since those days, because the Egyptians, like the French in 1889, constructed a standard for the cubit, a length of granite preserved with a fierceness to rival even the BIPM. Architects and builders made yardsticks based on the cubit rod, and brought them back periodically to make sure they didn't deviate too far from the cubit. This was good enough to build structures that have lasted for thousands of years. Figuring out a new measure for the kilogram might be a monumental task, but at least we're not forced to measure our gas mileage in tlacaxilantlis per cwierc.